Hey guys! Here's a tiny peek into my apartment. 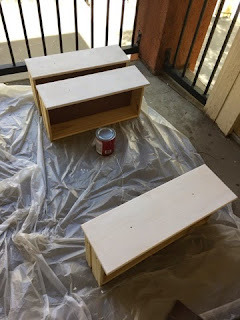 Last weekend I stained and painted an IKEA Rast 3-door chest. I found a DIY and after more searching, found a MILLION more. 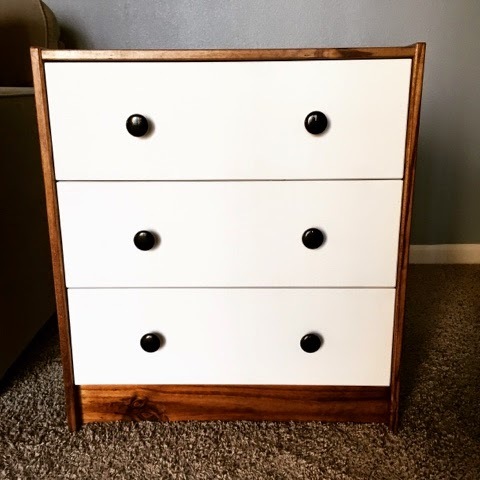 This is a super easy project and at $35 for the chest, it makes personalizing your space affordable. Since I just moved here, I had to buy all new supplies so I dealt with some costs (I think close to $70), but now that I have all the supplies it will make my future DIY projects a lot cheaper. 1. Assemble Ikea Rast cabinet. 2. Set up work station. I have a small balcony so while the weather was good, my Project Manager Matt helped me set up. 3. 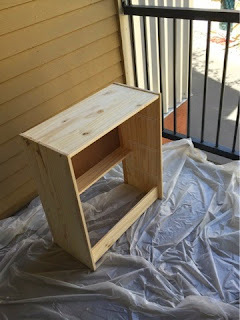 Sand the wood that you will be painting/staining. Be sure to wipe away any wood dust. Since I was outside, I just used my hands, but I've read that a vaccum with an attachment is quite helpful. 4. Stain wood. After waiting a few minutes, wipe with a cloth to remove any excess stain. If you would like it darker, wait according to the directions and add another layer of stain. 5. Paint other pieces of wood. I ended up staining the outside of the cabinet and painting the drawers. I didn't use a primer so it took 3 coats to get the coverage I wanted. 7. 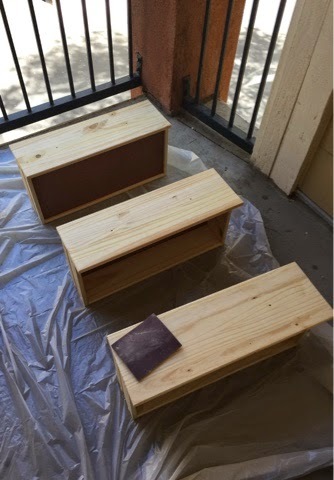 Once the stained wood has dried according to directions, apply polyurethane sealant. Follow the directions on this one. You can buy some that only require 1 coat or others that require 3. 8. 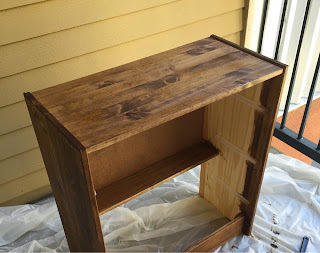 Let dry for 24 hours and then add knobs and put drawers in cabinet. Tip: To get Polyurethane off your hands (when you are inevitably washing the brush), coat hands with vegetable oil and then wash off with dish soap. There – I just saved you 20 minutes of freaking out and Googling. I'm currently using the finished product as a side table in my living room. It adds some style and storage, which is much needed right now. The piece is super versatile so I could definitely see myself moving it to be a bedside table at some point. Speaking of bedside tables, I recently picked one up on the side of the road. It needs some love (and some paint) so there will be another DIY post coming here soon. If you want to see what I've been up to in my professional life, check out this carrot recipe roundup I blogged earlier this week.